Ocean facing studios with large private, balconies. All studios have partial views of the magnificent Coral Sea and Trinity Beach. A view which features some of our beautiful tropical flowering trees. Furnished with Queen Bed or twin option. Self-contained with kitchenette and en-suite bathroom. Fully air-conditioned, ceiling fans, laundry on each floor level and lift access to all rooms. Wall mounted flat screen TV's with Foxtel package. Sofa bed for extra person (extra charge). Direct access from property via steps to the beach, esplanade and restaurants. Delightful airy studio room with two smaller balconies - one with partial views of the ocean and the other looking to the tropical hinterland. Furnished with Queen Bed. Self-contained with kitchenette and en-suite bathroom. Fully air-conditioned, ceiling fans, laundry on floor level and lift access to all rooms. Wall mounted flat screen TV's with Foxtel package. Sofa bed for extra person (extra charge). Direct access from property via steps to the beach, esplanade and restaurants. Delightful top floor room with two smaller balconies - one with magnificent views of the ocean and the other looking to the tropical hinterland. Self-contained with kitchenette and en-suite bathroom. Fully air-conditioned, ceiling fans, laundry on floor level and lift access to all rooms. Wall mounted flat screen TV's (Free-to-air only). Sofa bed for extra person (extra charge). Direct access from property via steps to the beach, esplanade and restaurants. Stunning, uninterrupted views overlooking the magnificent Coral Sea and Trinity Beach from a large private balcony. All apartments are self-contained with Queen Bed, kitchenette and en-suite bathroom. Fully air-conditioned, ceiling fans, laundry on floor level and lift access to all rooms. Wall mounted flat screen TV's with Foxtel package. Sofa bed for extra person (extra charge). Direct access from property via steps to the beach, esplanade and restaurants. Magnificent ocean views from the top floor. This studio comes with twin bed option. Ocean facing balcony, self-contained with kitchenette and ensuite bathroom. Fully air-conditioned, ceiling fans, laundry on floor level and lift access to all rooms. Wall mounted flat screen TV's (Free-to-air only). Sofa bed for extra person (extra charge). Direct access from property via steps to the beach, esplanade and restaurants. For those travelling with another couple or independent children, the Family Suite has a dual key option combining the Ocean Outlook Studio with companion Retreat room. There is an option for twin beds in the Ocean Outlook Studio. Both are self-contained with kitchenette and en-suite bathroom. Fully air-conditioned, ceiling fans, laundry on floor level and lift access to all rooms. Wall mounted flat screen TV's with Foxtel package. Sofa bed for extra person (extra charge). Direct access from property via steps to the beach, esplanade and restaurants. For those travelling with another couple or independent children, the Top View Suite has a dual key option combining the Top View Studio with the Top View Retreat. There is an option for twin beds in the Top View Studio. Both are self-contained with kitchenette and ensuite bathroom. Fully air-conditioned, ceiling fans, laundry on floor level and lift access to all rooms. Wall mounted flat screen TV's (Free-to-air only). Sofa bed for extra person (extra charge). Direct access from property via steps to the beach, esplanade and restaurants. Situated at the peaceful northern end of Trinity Beach, Amaroo at Trinity is the perfect base from which to explore the many tours and activities in the region. 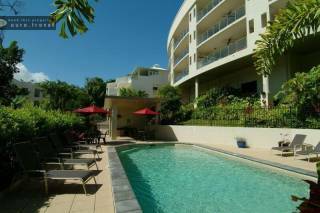 Comfortable Ocean View Studios enjoy stunning views over Trinity Beach from large private decks. Family Suites offer adjacent self-contained studios suitable for families and couples travelling together and enjoy both ocean and mountain views. 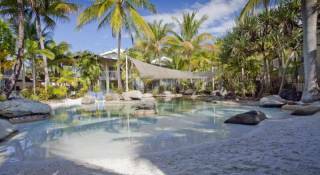 A palm-fringed pool is the perfect spot to relax in the sun beside the undercover dining and barbecue area. A Jacuzzi and full sized tennis court complete the resort facilities. Full Tour Desk facilities with helpful advice from friendly staff enable guests to make the most of their stay in this beautiful area. A deposit of one night's accommodation is required to confirm booking. Balance plus incidental expenses are payable on departure. If a booking is cancelled more than 7 days prior to arrival, deposit will be refunded less an administration fee of $45. Cancellation less than 7 days prior to arrival will forfeit the full deposit. There is no refund for early departure no matter what reason.